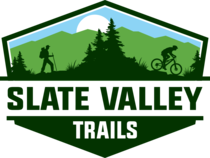 These new trails are entirely on private property and are open to the public through the landowner’s generosity and their partnership with Slate Valley Trails. An extensive network of trails purpose built and and designed for mountian biking. However, the trails are open to any non-motorized use including hiking, running, and snowshoeing.